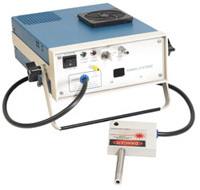 Includes solid state 785 nm diode laser, fiber optic spectrometer, fiber optic probe with focusing and calibration caps, sample chamber, safety goggles and 32-bit Windows operating software; has range of ~200-2700 cm-1. Solid state 25 mW 532 nm diode laser, fiber optic spectrometer, fiber optic probe with focusing and calibration caps, sample chamber, safety goggles and 32-bit Windows operating software; has range of ~200-4000 cm-1. Upgrade R-3000-785 or R-3000-532 by substituting cooled CCD-array spectrometer for standard (non-cooled) spectrometer. Upgrade R-3000-532 by substituting 50 mW laser for standard 20 mW laser. RAM-TB Sampling Tube for extending the probe working distance. Available length is 3.5"; available OD is 3/8"-3/4". Standard material is stainless steel; other materials and optional flanges are available. RAM-MC-VC Verification Cap loaded with spectroscopic-grade Teflon. RAM-MC-S Measurement cap for direct contact with solids, tablets, powders, liquids, etc. RAM-MC-L Measurement cap for measurements through the walls of vials, bottles, plastic bags, etc. RAM-PR-I Raman immersion measurement tube. RAM-PR-S Raman probe available individually. Includes one verification cap with preloaded Teflon calibration material and 2 focusing caps.